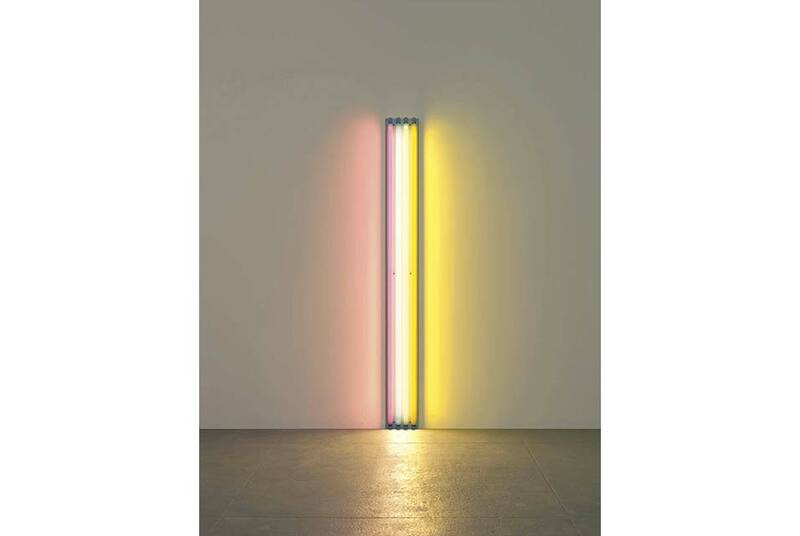 Guild Hall Museum opens "Aspects of Minimalism: Selections from East End Collections"
Dan Flavin, Untitled (to M&M Thomas Inch), 1964. Four 8-foot fluorescent lights (from left to right: pink, daylight, cool white, yellow), with fixtures, 96 x 10 ½ x 5. EAST HAMPTON, NY.- Guild Hall Museum will present Aspects of Minimalism: Selections from East End Collections from August 13 through October 10, 2016. The exhibition features paintings and sculptures by preeminent artists associated with the movement such as Dan Flavin, Donald Judd, and Agnes Martin, along with work by artists influenced by the Minimalist aesthetic including Joseph Beuys, Gerhard Richter, and Rachel Whiteread. Many of the works, on loan from major private collections on the East End of Long Island, are on public view for the first time. Spanning six decades, the exhibition begins with work from the late 1950s just as Minimalism began to take shape in New York, and concludes with work relevant to the Minimalist aesthetic from the 1990s and 2000s. The 14 artists presented in Aspects of Minimalism: Selections from East End Collections are Josef Albers, Joseph Beuys, Dan Flavin, Donald Judd, Robert Irwin, On Kawara, Yves Klein, Agnes Martin, Blinky Palermo, Gerhard Richter, Bridget Riley, Edward Ruscha, Andy Warhol, and Rachel Whiteread. Filling the Museums entire exhibition space, the show investigates for the first time on the East End the broad range, reach, and important legacy of Minimalism. Minimalism emerged in New York as a movement in the late 1950s and continued for two decades. By presenting a simplicity of form and content, artists working in painting, sculpture, and installation sought to remove any sign of personal expressivity, and allow the viewer to experience the work more intensely without the distractions of overt symbolism, narrative, and emotional content. There are examples of Minimalist theory as early as the 1920s in Europe, but the movement at the time of its birth was defined by new young artists who were often reacting against the gestural excesses of Abstract Expressionism, challenging the conventional boundaries between various mediums, subordinating authorship, and calling attention to the materiality of their works.